When I took Dorie Greenspan’s Around My French Table down from its place on our four-cookbook living room shelf (the other three volumes being Thomas Keller’s The French Laundry Cookbook, Paul Bocuse’s Bocuse in Your Kitchen and Cook’s Illustrated’s The Best Recipe) last week, I was guiltily reminded of my grand intentions for cooking its entire contents for the Cute Gardener and then the slow as molasses journey I have been on to do so. A note card placed inside used as my bookmark, had a lonely four notations of recipes made over the last two years: mustard batons, tomatoes Provencal, olive-olive Cornish game hens and gougeres. 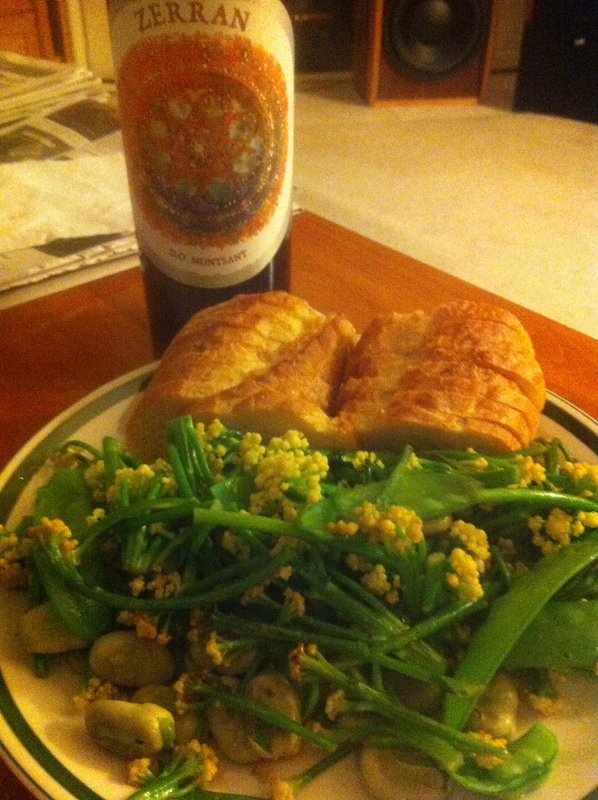 I didn’t add the salad nicoise I attempted once minus the actual nicoise olives—for obvious reasons. How pathetic, I thought! * And then went about remedying the situation immediately. 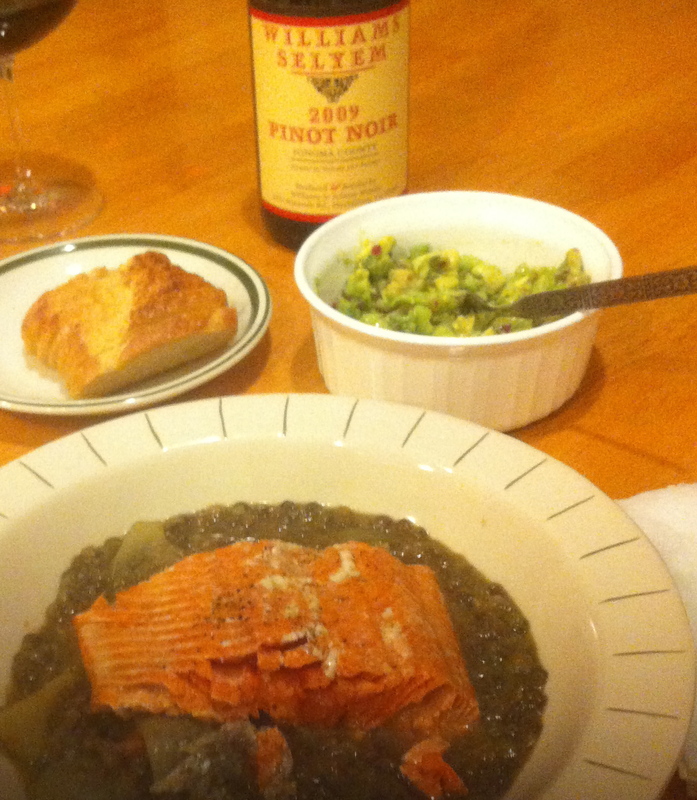 I chose a dish of Roasted Salmon with Lentils because salmon is one of the top five things I can cook as well as one of the CG’s favorite meals. His own father has told me twice on Christmas that I cook the fickle fish perfectly and I take pride in delivering new ways to adore yet not overly adorn its simple yet complex filets. Of course these days, the CG and I go the full mile in sustainable fish integrity and will only eat the approved varieties so it took a few phone calls to discover that I would have to drive the fifteen miles to another city to retrieve a slab of wild sockeye to fit the bill. But the fish karma worked in my favor regardless as it ended up being severely on sale. The end result was deliciously earthy, grounding the delicate fish. It reminded me how much I love my lentils, especially the French version simmered slowly with classic carrot, onion, celery and bay leaf. 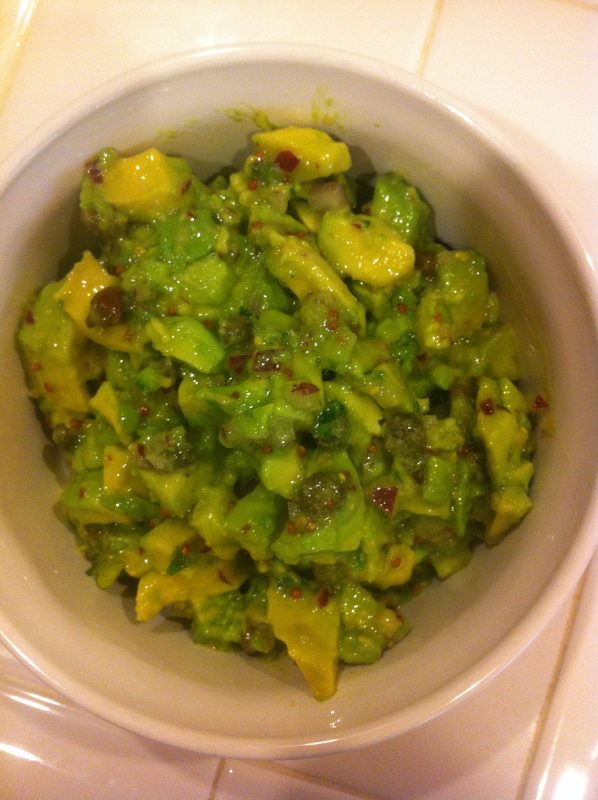 Because I wanted the dish to be the star and didn’t want to overburden the already hearty lentils with traditional cheese desserts or anything heavy, I settled on a light and tangy avocado tartare that had synchronistically arrived in my Food and Wine e-letter a few days earlier to start the meal. Served slightly below room temperature on small slices of baguette it was a perfect palate primer for the evening. Now I have five notations on my bookmark and a renewed motivation to step up my cuisine Francaise. *In my defense, it’s hard to summon the constant desire to cook when I live with a man who can throw pasta in a bowl with some leftovers and make it taste like nirvana; or, whose vegetables from the garden, even when mutant and odd like his recent batch of caulifower, taste better than most things I eat in restaurants. This entry was posted in Art of Cooking, French Affair and tagged a french affair, Around My French Table, art of cooking, avocado tartare, cheese gourgeres, cornish game hen recipes, Cute Gardener, Dorie Greenspan, food and wine magazine, Kimberly Nichols, Mustard Batons, mutant cauliflower, roasted salmon and lentils, sockeye salmon recipes, tomatoes provencal, Unorthodox Foodie by unorthodoxfoodie. Bookmark the permalink.